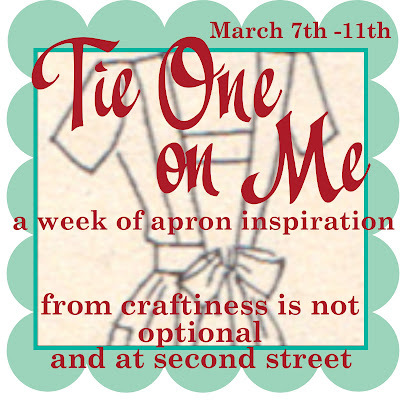 Next week my friend Jess of Craftiness is Not Optional and I are teaming up to bring you a week of apron inspiration. Although I've made lots of aprons as gifts, I never made one for myself and I've always wanted to. Jess was in the same boat and I know there are others out there. We hope to inspire all of you to take time to create something for yourself. We're both doing tutorials, an apron round-up, a few giveaways and a blog hop link party on Thursday where we would love to see all your apron making inspiration. Here's a little sneak peak. I'm sure you dying to see more...you'll just have to wait until next week. I love aprons, I sell them, have made probably 200+ cant wait to see what ideas you ladies have!! Looking forward to it. Awesome colors on the sneak peek!! i even have the fabric just never did it. can't hardly wait just the swift kick i need. I too, have never made one for myself! I can't wait for tutorials and inspiration. I will be following your ideas and tutorials. I love creating vintage aprons and will be sharing a few next thursday with your link party. Thank you for the smile you brought to my face when I found this!